…and then miscarrying the next evening. I purchased months worth of prenatals, months. I’m still nursing my 17 month old, so they won’t go to waste, but it’s so cruel. In the past, I’ve gotten pregnant when I hit the jackpot of discovering a coupon for my brand of tampons and stocking up (this has happened with each of my three pregnancies). Nine weeks of hopeful anticipation, taken away in a matter of hours. After a week of spotting, the final day turned to blood and I started cramping mid-day. 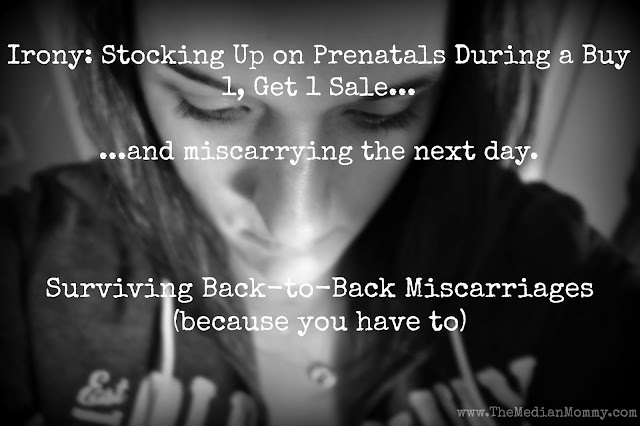 By 8pm that evening, I had miscarried. All things considered, the process was smooth and I was happy to have been at home. Unfortunately, my husband had gotten called into work because of a snowstorm, so I was alone the night that it happened. Is it terrible that I feel that miscarriages, back-to-back miscarriages, are things that happen to other people, but not me. I had a brief period of anger before the sadness hit me square in the gut, knocking the air out of me but for sobs. This past summer I learned not to ask why, but it is so darn hard not to. I wish I could understand, and maybe once the pathology report comes back, I will. On the flip side, if the pathology report comes back with a normal, healthy baby, then more questions [tests] will arise. I know I will make myself crazy trying to figure it out, but I just can’t stop trying to wrap my mind around this. I was able to have a healthy pregnancy with my son, no problem, so why am I having problems now? It’s not as though there is a huge amount of time between my son and these pregnancies, he was 10 months old when I got pregnant in the spring, and then 15 months old with this last pregnancy. I worry that my window of time is running out, as I’m 36 years old. I know I should be grateful that I’ve gotten pregnant easily (my last two pregnancies came about on the first try), but it’s not comforting when I’m unable to stay pregnant. I’ll be curious to see what the doctor says, as right now he’s just saying that I shouldn’t chalk these miscarriages up to anything just yet, and for us to try again as soon as we’re ready.